I want to tell you, friends, it was a very strange situation. One day I was in Hollywood taping some spots for ME-TV and two government men with badges approached me and whisked me away and next thing I know I’m in the White House standing in front of Donald Trump. “Why have you brought me here, Mr. Trump,” I asked. 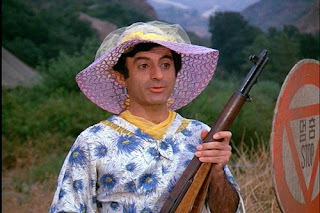 “You’re the actor Jamie Farr who played Klinger on the television show MASH, aren't you?" “Sir, I only played a character on MASH, which took place in Korea. I’m no expert on Korea!" "You have to know more than I do! You certainly knew enough to wear a dress to attempt to get out of the army. Hadn’t they invented bone spurs yet? “That no-talent liberal! What kind of ratings is he getting lately?" The next day we were in Singapore, standing in the meeting hall about to meet Kim Jong-un. “Here he comes! What do I say, Klinger?" “I don't think that went over well, Mr. Trump."